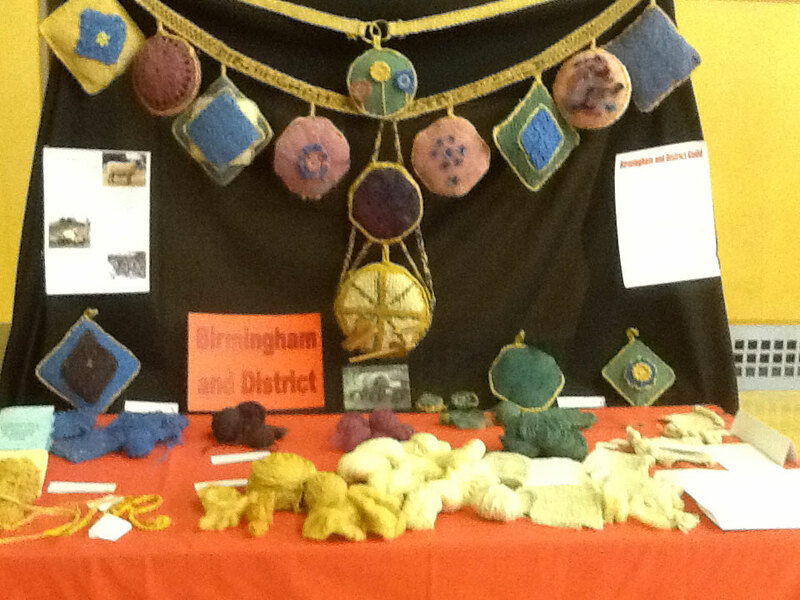 Over 30 years ago Gloucester Guild invited several local guilds to join them in putting on an exhibition. The first one was at the Brewery Arts Centre in Cirencester. This was so successful that we decided to continue to mount an exhibition every two years. Each guild took it in turn to host the exhibition. Some dropped out, and others joined in, but the number settled and the name “Six Guilds” was used. For many years we were able to hire good central locations where we could exhibit for long enough for word of mouth to publicise our efforts. However this became more and more expensive and difficult so that we began to alternate a lecture day with the usual exhibitions. The lecture days gave members the chance to meet others from neighbouring guilds socially to exchange information and experiences, and we could afford the best speakers. Recently the lecture days have become the norm, supplemented by small themed displays from each guild, plus a small Trade Show. The usual two-year gap should mean that the next Six Gullds Day would be in 2015, but this will be Stratford Guild's 40th birthday so we are hoping to arrange various celebrations, and several of the other guilds are helping to arrange the Association of Guilds Summer School in August, which is at Moreton Morrell, very close to Stratford (wsdss15.blogspot.co.uk for details). The next Six Guilds meeting will instead be in 2016, hosted by Cotswold Guild. Click each name, or see www.wsd.org.uk for information about these guilds. Stratford hosted the day in 2013 at King Edward VI School in the centre of town. We had two speakers: Isabella Whitworth, the dyer, spoke on “Hunting Purple, filling buses” in the morning, followed by lunch and time to browse the trade stalls. 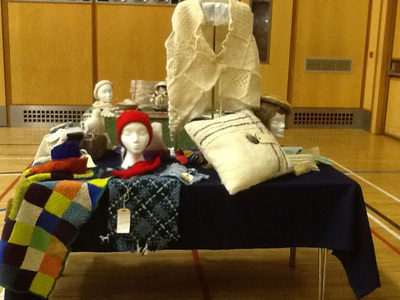 In the afternoon the speaker was Joan Baxter, the tapestry weaver, on “Landscapes of Inspiration”. Each guild had taken a particular breed of sheep and produced a wide range of goods and information showing the fleece characteristics and uses. The 2009 Six Guilds Day was organised by the Gloucestershire WSD Guild on the theme of a “Kaleidoscope of Colour” and held at Cheltenham Racecourse on 24 October 2009. The speakers were Tim Parry Williams and Bobby Kociejowski. Tim Parry-Williams is a Senior Lecturer at Surrey Institute of Art and Design having trained there. He also went to the Okinawa Prefectual University of Arts, Japan. He is a hand weaver and much of his work is inspired by Japan. Bobby Kociejowski is a dyer and weaver. We had a wonderful day in the Gold Cup Suite at Cheltenham Race Course. What a superb venue and simply marvellous facilities. 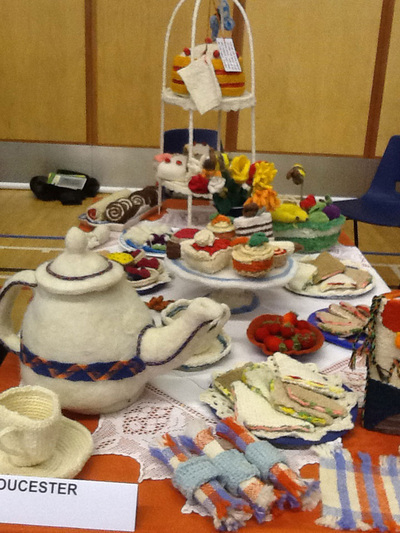 The theme that the Gloucestershire Guild chose was based on a Colour Wheel. We were all so pleased to be given the colour blue as there is just so much to choose from and we thought a blue watery theme would give us lots of scope. So we decided the first thing to do was some dyeing which we all enjoy and take it from there. We did some indigo with mixed success, a woad vat which was better and some great Kemtex dyeing in a 6ft piece of guttering outside one sunny day. 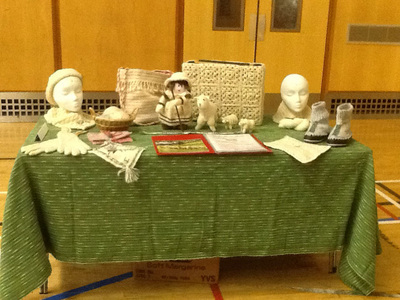 We ended up with a huge variety of shades of silk and fleece and linen and we had a great time. And it was that getting together and all that enthusiasm of Guild Members to create their own thing that became more important than the original watery theme and we had lots of fun along the way. So I'd like to thank everyone for their contribution to our blue collection and especially Ann and Ros who made such a great display of everything. 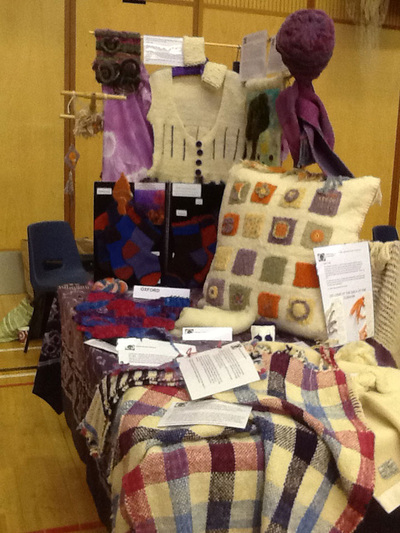 Also to the Gloucestershire Guild for their inspired idea that gave us all such a buzz. Worcestershire and Stratford WSD Guilds co-hosted the 2007 meeting, which was a day of talks entitled ‘Inspiring Textiles’, and was held at the Worcestershire Wildlife Trust building on 29 September. Some members (and their husbands) were there from 8am to help set up trade stands and a book stall, whilst others were busy preparing lunch. After coffee we assembled in an impressive timbered barn and were welcomed by Pat Crook, the Worcestershire Guild chairman. The two speakers, Sue Lawty and Jane Callender, were excellent and between them covered a wide range of interests. Sue, a tapestry weaver, showed slides of her work, ranging from groups of small pieces to very large hangings commissioned for overseas embassies. More recently she has been making natural installations using rocks, pebbles and fragments of coral. By midday the sun had come out and we were able to enjoy a lavish ploughman’s lunch outside. 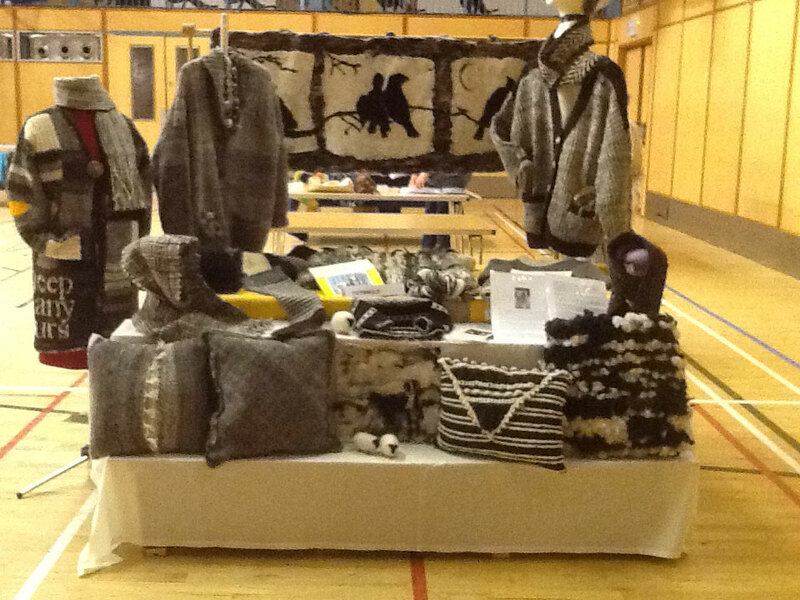 There was then ample time to browse the trade stands. The afternoon speaker, Jane Callender, outlined the history of Shibori. Although ‘squeezing together’ and dyeing may sound a fairly simple process, we now better appreciate the patience required to mark out, stitch and gather the fabric to achieve such detailed and intricate designs. Tea, cakes and a final look round the trade stands ended a most successful and enjoyable day in delightful surroundings. We went home with lots to think about, a truly inspiring day.